Senior Curator Pacific Cultures Sean Mallon looks at what the archival and published record tells us about tattooing in Tokelau. 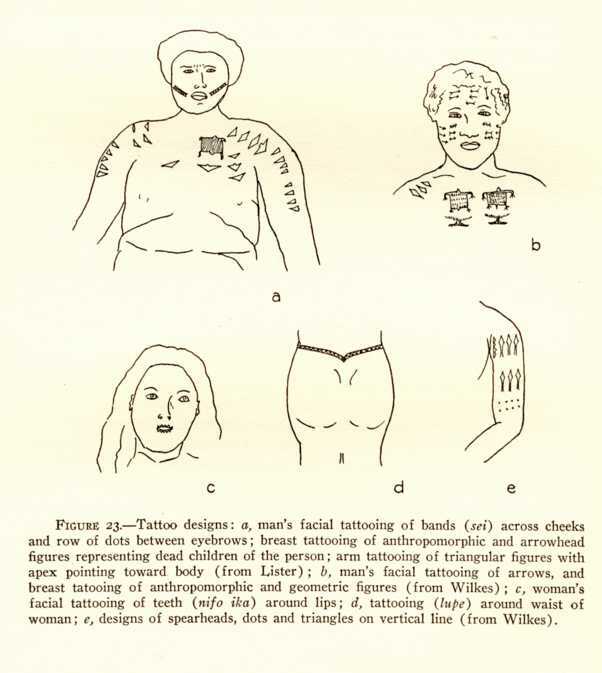 One of my main research interests is in Samoan tattooing and during the course of my work in archives and museums, I’ve come across many little snippets of information about tattooing in the Pacific Islands. 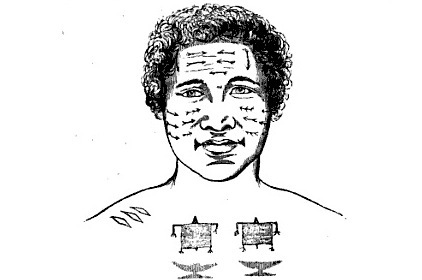 This includes a few, but only just a few, accounts and images of tattooing in Tokelau. They may be well-known to some readers, but perhaps new to others. 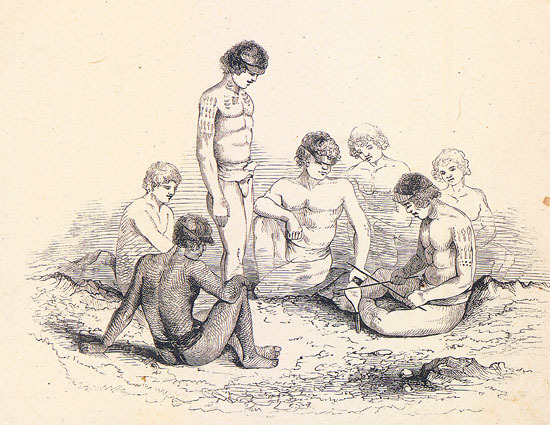 The key accounts of tatau (tattooing) in Tokelau were recorded in the 1800s by European explorers and other observers. They say the tattooist’s ink was made from a mixture of soot from a charred coconut mixed with water. According to one account, the pakiau (puncturing instrument), was made of a short stick with a set of fine teeth of turtle bone lashed at right angles at one end. It was tapped with another stick to deliver the pigment into the skin . A double row of lines with little crosses between was drawn down obliquely upon each cheek, and images of turtles were tattooed on the breast. The arms down to the elbow were also tattooed with small triangles. At the time of Lister’s visit the high chief had four such figures: one for the past king, one for a dead female relative, and two for dead children. He had also smaller triangular or geometric figures for children who had died at an early age. This final image is from the National Library Collections in Wellington. It’s titled [Lister family]: Tattooing on an old woman of 60-70 at Fakaafu – one of the Union Islands… ca 1888. Notice the close up detailing of the motifs. Lister, J. J., Notes on the natives of Fakaofu (Bowditch Island), Union group: Roy. Anthrop. Inst., Great Britain and Ireland, Jour., vol. 21, pp. 43–63, (1891). Awesome finally some documentati9n tatttoing from my homeland of a Tokelau. How can I get a copy of this sent to me please. Thank you for this. I have very much enjoyed reading this. since I was little, I have always adored turtles or honu. As I grew older I had intended to get a turtle tattooed but could never find one I was drawn to. Until I came across the turtle design used by our tupuna. It will have more meaning to me know to get a couple tattooed as they will represent my father and my brother. I’m wondering about Tokelauans with a pe’a. Could it be because they are also Samoan and while they acknowledge their Tokelauan side, they actually identify as a Samoan? Just a thought :). thank you again for sharing this via this forum. Thank you for reading the blogpost Alieta and for taking time to comment. 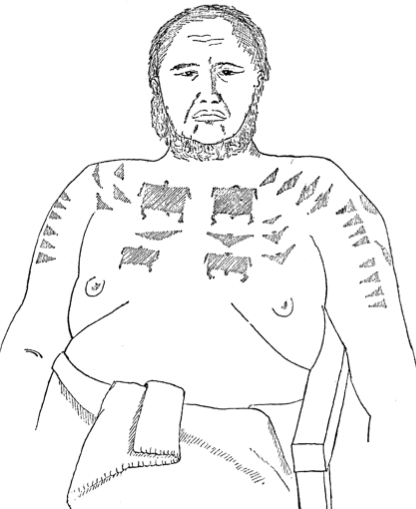 I have heard of small number of Tokelauans who have been tattooed with the pe’a. Like other non-Samoans who wear the pe’a, it could signify their connection to Samoan families through intermarriage; their strong relationship to Samoan communities (especially if they lived in Samoa for a long period of time), or just their love of the pe’a or of tattooing. As you suggest, it could also be because they are also Samoan/Tokelauan, and while they acknowledge their Tokelauan side, they identify more as a Samoan. Whatever the case may be, it is interesting how important tattooing was and still is as a symbol of all kinds of things including peoples ethnic, cultural or personal identities. Thank you for bringing this issue up in the blog and contributing t he discussion. Thank you for your comment Ineleo. Are you living in New Zealand? There are many good tattooists here who specialise in Pacific tattooing designs. Like Falipo I am a Tokelauan looking for inspiration for a tattoo and found this blog via a Google search. Thanks for posting as there is so little available information on Tokelauan tattoo design, motifs and history. I would be really interested to see any imagery you may have access too. Finally!!! I am a Tokelauan who has been searching and searching for inspiration to create my tattoo design. This is brilliant!! Interesting to read also about ties to Samoa via Tilifaiga and Taema. Thank you for the feedback Filipo…I’m glad the blogpost was of interest. I’d love to see some of your Tokelau tattoo designs when you have them done…best wishes. Very interesting. What do you make of Tokealuans with a pe’a? I don’t know how common it is, but I know that one tufuga ta tatau recently travelled to Tokelau from Samoa to apply the pe’a. Purportedly, Tilifaiga and Taema (the mythical goddesses of tattooing) stopped in Tokelau on their way to Samoa a long time ago. Tilifaiga and Taema were also (supposedly) given a Tuluma to safeguard their ‘au. What do you make of this? Would you say that the pe’a and malu are indigineous to Tokealau’s tattoo history? Hi Lagi, thank you for reading the blogpost and commenting. I am aware that there are Tokelauans in New Zealand with the pe’a. This doesn’t surprise me given the close associations Tokelau and Samoan communities have with one another. I also saw the recent news story you mention about a tufuga ta tatau travelling to Tokelau from Samoa to tattoo a man with the pe’a. It was a fascinating story, I wondered if it was a first for Tokelau. Unfortunately, I don’t know of any historical observations or published sources that would suggest the pe’a was indigenous to Tokelau. I also can’t identify a source confirming whether Tilafaiga and Taema stopped in Tokelau on the way from Viti (Fiji). Is it part of the Tokelau oral tradition? Thank you so much for sharing this information, it is just great. Kia ora, fascinating as another tradition of tatau emerges from an island that I have only a fleeting understanding of. I hope to visit the Te Papa Museum next year when I will visit Aotearoa for the first time. many thanks Roji, for reading and feeding back on the blogpost. 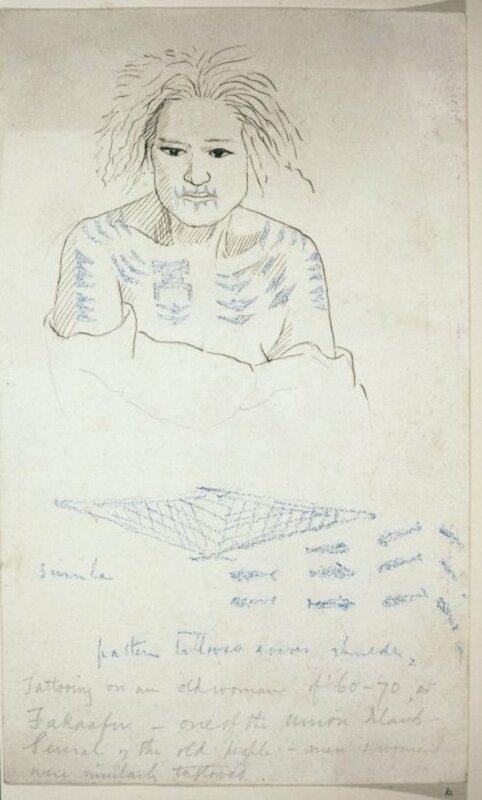 There is still much to learn about the histories of tatau in the Pacific, but we are glad you found this article of interest.